The Irish broadcaster Setanta Sports has gone into administration after failing to make a number of payments to sporting organisations. Setanta has now stopped broadcasting to customers in Great Britain, but the administrator Deloitte said it would continue to operate elsewhere. They said they would immediately stop collecting subscription payments. About 200 employees involved with the British operations will be made redundant, the firm said. Setanta had a total of 420 employees in the UK and Ireland. "This is a sad day for all concerned," said Sir Robin Miller, chairman of Setanta. Setanta will continue to broadcast in Ireland. 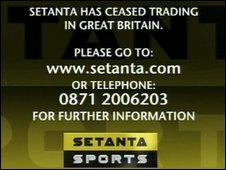 Setanta International and Setanta Ireland have not entered administration. Setanta Ireland will cover broadcasting in the Republic of Ireland and Northern Ireland. Setanta also had a contract with the FA to broadcast England home friendly matches, FA Cup ties, England U21 games and the FA Community Shield. The FA's chief executive Ian Watmore said it would now "consider options to find the best platform to broadcast those fixtures contracted to Setanta", adding that it expected "significant interest". Analysts say Setanta has been running at a loss of about £100m a year, after missing subscriber targets. The broadcaster has 1.2 million customers, 700,000 short of the 1.9 million that industry experts believe they need to break even. Setanta Sports missed payments to both the English Premier League and the Scottish Premier League (SPL) in recent weeks, resulting in both organisations taking their respective broadcasting rights back. On Monday, the US sports network ESPN bought the rights to show the 46 English Premier League games Setanta was due to show next season, as well as the 23 matches it was to broadcast in each of the following three seasons. The SPL has said it is also looking for a new buyer for its domestic broadcasting rights. Setanta also has broadcast deals with the Blue Square Premier non-league football in England, IPL cricket and the PGA golf tour. Mike Darcey, the chief operating officer Sky - Setanta's rival for showing Premier League games - said its competitor had "tried to grow too fast and lost control of costs". He said it was "sad that Setanta's staff, many of them former Sky employees, must pay the consequences". Sean Williams, managing director of strategy at BT Retail, said: "The failure of Setanta throws into stark relief the market failure in pay TV in the UK. "Competition in pay TV in the UK is not working effectively. This gives rise to significant harm to consumers in the form of higher prices, restricted choice and diminished innovation." BT added that it was in talks with ESPN about a deal to show the English Premier League matches that it has bought the rights to for next season, and is telling customers to retain their BT Vision/Setanta viewing card. Virgin Media has also confirmed it is in discussions with ESPN.